Before you invest in a procurement system, make sure it's built to serve your organization's specific needs. By tapping into the knowledge of experts in the e-procurement industry, you can gain insight into exactly what to look for when evaluating procurement and expense management solutions. 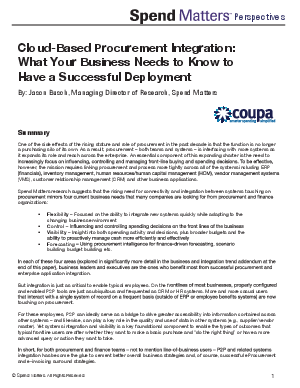 This solution evaluation guide and pre-formatted RFP form from Coupa was designed to help CFOs and financial decision-makers choose an effective management system that will quickly deliver an ROI. With over 400 line items, it covers everything from requisitioning and approvals to invoicing and budgets--and the template can be adjusted to accommodate additional areas in which you would like to receive information. Take the guesswork out of selecting a procurement and expense management system. Download the solution evaluation guide now to easily identify the core competencies your organization should look for from a system provider.